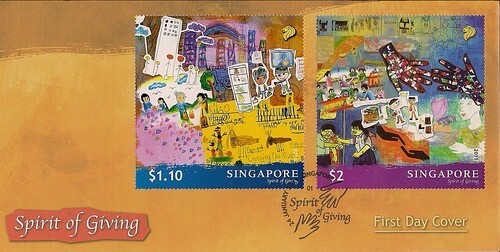 This is the "Spirit of giving" stamps from Singapore issued on 24th January 2011. The size measures 73.88mm x 76mm and certainly will have a problem to fit into a standard 4" x 9" envelop with address. I'll be interested to see if there are any used copies of these stamps. With so many things to show in a stamp, it makes sense to make the stamps this big....better than squeezing all of that into a small stamp resulting in nobody being able to appreciate them. I wouldn't mind if Pos Malaysia came up with such big stamps once in a while.